A Power Training Bag looks like a cross between a punching bag used by boxers and a duffel bag with multiple carrying straps. Filled with sand, Power Training Bags come in various sizes, ranging from 10 kilograms to 20 kilograms. Although you'd probably get in big trouble for dropping iron weights at the gym, you can throw or drop a Power Training Bag on purpose without damaging property or smashing someone's fingers or toes. If you're traveling, you can empty the contents and fold up the bag, then refill it with a plastic sack of sand when you get to your destination. 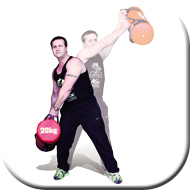 Great for rotational and diagonal patterns and in combination with simple lunge exercises it is a powerful training tool.